When I learned that the National Museum of American Jewish History would be collaborating with the Philadelphia Museum of Art on an interfaith forum and conversation about the Rembrandt and the Face of Jesus exhibit at the art museum, I was eager to sign up. So much has been written about this exhibit, both in secular press (New York Times and Philadelphia Inquirer) as well as the Jewish press (Tablet and Forward). It is a topic that is not surprisingly fascinating to Jews, as Jesus was born of Jewish parents and so much strife over the centuries have been waged in his name by descendants of his apostles. It was thrilling to be in the audience with members of the other faiths, in a harmonious conversation about a religious icon and symbol, because we usually only are taught by members of our own faiths. Larry Silver, Professor of Art History at the University of Pennsylvania, moderated the interfaith panel discussion, and he launched it with a query from his curator friend who asked, “why not the head of Christ?” He proceeded to answer it himself by pointing out the works of Rembrandt represented a movement away from iconography towards a more human portrayal of Jesus, and the face is the window onto the human soul. He then presented to us in the audience and the panel members (on a separate monitor) about 13 paintings of Jesus, only one of which was by Rembrandt. Regarding Matthias Grünewald’s The Crucifixion, from 1515, Arnold Eisen, Chancellor of the Jewish Theological Seminary in New York City, noted that it was not beautiful in the same way that the Holocaust is too grotesque, too harsh for beauty. Professor Silver commented that Jesus was twice the size of every other figure in the painting and Jayne Oasin, Associate Priest of the Associated Parishes of Saint Stephen in Riverside and Beverly in New Jersey pointed out that the light highlighted the darkness. Regarding Marc Chagall’s White Crucifixion, from 1938, Reverend Oasin noted that the painting has all the woes of mankind, and it reminds her of the Four Horsemen of the Apocalypse. Chancellor Eisen taught that at the turn of the 20th century, there was much identification by Jews with the life and death of Jesus. This was exhibited by Martin Buber and later by Elie Wiesel who wrote about Jesus in the Holocaust. “Jesus had become the universal figure of suffering,” not as Savior. The figure in green in the right foreground is often depicted by Chagall as the Wandering Jew who needs to flee from calamity. Zakiya Islam, a Muslim woman and a Ph.D. candidate in Religious Studies at Temple University taught that a tenet of Islam is that in times of suffering, one is to run away. Regarding a local painting by Thomas Eakins, The Crucifixion, from 1880, Chancellor Eisen noted that Jesus has no face, because the human soul is no longer there and because of the failure of ethics and goodness. Reverend Oasin said that we can no longer turn our face away — the viewer’s eyes are riveted to Jesus in the middle ground — reminding us of our sin, our inhumanity. James Redington, a Catholic and Jesuit priest, pointed out that death had occurred through strangulation, as Jesus in the painting has pushed his back up against the cross in an attempt to breathe. Ms. Islam said that there is no mention of the Crucifixion in the Koran. There is suffering and struggle, but there is no focus on any specific suffering. While Jesus, called the Spirit of God, and Mary are much beloved in Islam, there are no images in the Muslim religion. Chancellor Eisen taught that while moderns refer to the Enlightenment as bringing light into the world, the previous Dark Ages, to the pre-moderns, their religions had already brought light into the darkness of the world. In fact, to the religious, the modern world contains a little less light than much earlier in our history. Regarding William Holman Hunt’s Jesus, Light of the World, from 1854, Reverend Oasin asked if Jesus is knocking on a door? 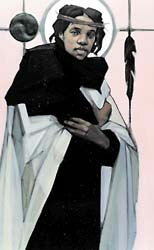 Ms. Islam said that this painting resonated with her, as Jesus is depicted with a mystical air (unlike the later, more human depictions of Jesus). An amazing painting for the Jews in the audience was Maurycy Gottlieb’s Christ Preaching at Capernaum, from 1879, because Jesus is a Rabbi who is preaching at a recognizable synagogue (Capernum is on the Sea of Galilee in Israel). Reverend Oasin pointed out that Jesus has his arms outstretched, as Christians do to celebrate the Eucharist (unlike the Kohanim’s spread-finger stance for blessing the congregation). Warner Sallman’s Head of Christ, from 1940, would be recognizable to just about any modern-day person, even one who is not a Christian. It is the most popular depiction of Jesus. Reverend Oasin, who is black, reminisced that when she was a girl, this painting showed her that Jesus does not look like her, does not look at her. Father Redington called this the Protestant Jesus. One member of the audience commented that Rembrandt’s compatriots were the early readers of the Bible. No, said Professor Silver, the Gutenberg Bible was printed in 1450 and by 1637, there was already the Dutch State Bible in translation. He added that by the 1520s, Martin Luther had already translated the Bible into German and today, we are witnessing the 400th anniversary of the King James’ edition of the Bible. Chancellor Eisen taught us that the Calvinists loved the Old Testament and Rembrandt had lived around the block from Spinoza and Rabbi Menasseh ben Israel. Another person from the audience noted that Grunewald had the rare blend of symbolism and realism and Professor Silver concurred that it was a blend of the glorious and the suffering. Reverend Oasin pointed out that people come to religion for comfort, so they do not relish a focus on harshness. Chancellor Eisen taught that the artist acts in the role of spiritual narrator, thus art is a gift from God. A Jewish member from the audience asked about the depiction of challah in the scenes with Jesus’s final days. Wasn’t it Passover? “No,” said Professor Silver, “by the second century, the Last Supper had been uncoupled from the Passover Seder.” John, the most anti-Semitic of the Gospels ensured that references to Jesus’s Jewish roots were eradicated or at least minimized. Reverend Oasin added that John was also the most anti-dark of the Gospels, with his numerous equations of whiteness to goodness. When she teaches her seminarian students, she tells them they can teach about John, but they have to unpack him (of his baggage). Professor Silver proclaimed the Dutch of Rembrandt’s day very inclusive. The artist even painted the Ethiopian convert with Jesus, not just once, but twice. Another member of the audience asked about the ladder in Chagall’s painting and was it a sign of hope, amidst the dire symbols in the rest of the painting. Well, replied Professor Silver, a ladder can go down as well as up and a ladder usually is simply the means to remove the mortal remains. After a brief intermission, there was the keynote lecture by David Morgan, who has a dual appointment in the departments of religion and art, art history and visual studies at Duke University in Durham, North Carolina. He commenced with a rhetorical question: what does it say that a painting is of Jesus? Does he look like us? A likeness can be the resemblance of an image to an original based on features they share. Drawing on neuroscience, our brain looks for resemblances, matches in our surroundings– “our brain wants to see order in the world.” A likeness is also the result of a powerful drive to emulate an archetype, such as a baby swan that mimics the preening of its parent or a pedestrian to a store mannequin. The engine is the desire. Third, to Christians, the image of Jesus presents what he was like, a recognition of an affinity between his appearance and what the faithful believes, knows, feels, and sees within themselves about him. It is an intimate connection that the devout viewers feel between Jesus and themselves. The basis of likeness is an archive of images composed of all the images people have ever seen in an endless chain of reference. The Gr&uumlnewald paintings we’d examined earlier in the program were unique in balancing the majesty and the personal. Traditionally, artists relied on iconography– the halo, cross, banner, book, instruments of his passion or other references to biblical narratives or events- to identify Jesus and his power. In contrast, Rembrandt focused on the face in painting a modern portrait. The artist takes his historicity seriously, endowing Jesus with a new kind of reality, as a personification of humanity. The facial features included: a broad forehead, shoulder-length hair that is parted in the middle, a long, symmetrical nose, a short, cropped beard, widely-set eyes, the appearance of ears, and a solemn, serious expression. Rembrandt appropriated a contemporary trend in depicting Jesus close-up, in a head-and-shoulders pose, and with eyes that address the viewer. 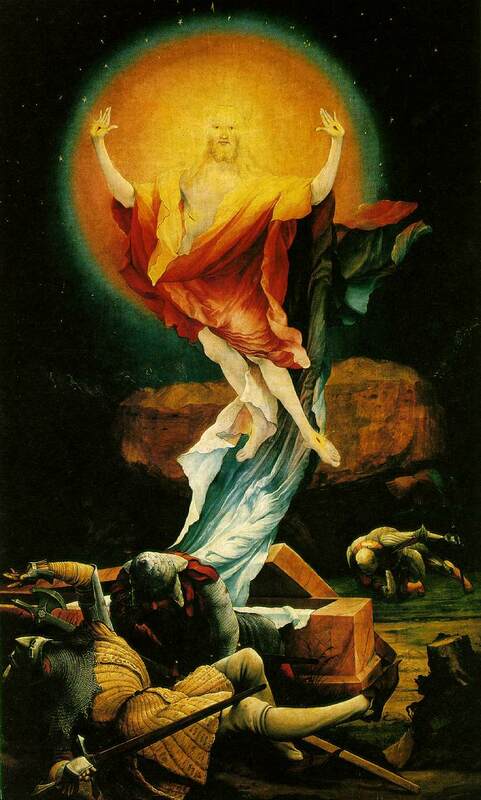 He also “located Jesus before the viewer as a contemporary person.” The artist may be said to have contributed to the 20th century preference for portraying Christ in poses that highlight a direct engagement of the personality over the traditional symbolic devices used to convey theological meaning. The visual archive that Professor Morgan referenced earlier is so strongly entrenched that when he displays iconoclastic images of Jesus– such as an obese Jesus- even hard-core Calvinists (with presumably less fixation on imagery) reject them. “We have our own images, even if they’re suppressed.” Ms. Islam noted that Muslims do not have a tradition of imagery, but they do have the narrative. When they come to the West, they too become influenced by the archive of imagery. Despite the despair depicted by Chagall in his White Crucifixion, Chancellor Eisen in his parting remark said that it is hopeful that we can have an interfaith conversation about Jesus. May the harmony and respect on display at the program carry forward into other realms of our contemporary world.